Our Grand Knight, Bob LaForest, has confirmed that our next meeting will be Wednesday, March 13th. Donut Sunday is March 24. Please try to attend this upcoming meeting. VIVAT JESUS! This is just a reminder that there is a Regular Business Meeting on Wednesday, April 4th starting at 7PM in the St. Pius X Social Hall. We will be opening nominations for Council Officers at that time. If you are interested in helping our Council by becoming an Officer, please attend this meeting. If you would like to know more about a specific position, feel free to attend the meeting or email me (raybilyk(at)kofc3956.org). If you cannot attend the meeting, but are interested in running for a position, please email me as well. (A great PDF pamphlet with descriptions of the Officers and their responsibilities can be found HERE.) After tonight, nominations will be tabled until the May 2nd Regular Business Meeting, where we will ask for nominations once more, close nominations and elect Officers. A VERY IMPORTANT REMINDER… There are at least 2 Officers (Deputy Grand Knight Dave Sajdak and myself) that will NOT be running for those offices again! We REALLY NEED Brother Knights to step up and run for offices this year. I am serious when I say this: If I can do it, you can also! We will also be discussing our Coffee & Donuts/Membership Drive on Sunday, April 8th, our Charity Family Breakfast and Tootsie Roll Drive on Sunday, April 15th and other upcoming events. Hope to see you all there! God Bless! If you still have any glasses/cups/mugs for our WORLD FAMOUS Dime Toss Booth, you can bring them in person this weekend. We can always use more! I’m attaching a flyer for the festival so you know the hours and what’s happening. Our WORLD FAMOUS Dime Toss Booth will be in the Game Tent, and we’ve also been asked to help on Sunday in the new Beer Garden. This festival is very important for us because this is also our MEMBERSHIP DRIVE WEEKEND! We can use EVERYONE who attends to assist in asking eligible Catholics to join us in our good works… that they can see with their own eyes! I’ll make it interesting… FOR EVERY PROPOSER WHO BRINGS IN A NEW MEMBER (and they join us), I WILL GIVE THEM A $5 GIFT CARD FOR LITTLE CAESARS (or a $5 donation in your name to St. Pius)! (No, I don’t get a discount on the pizzas… I wish!) Ask anyone and everyone to join us in the Knights of Columbus! Next Wednesday, September 6th at 7PM, we will be holding our monthly meeting in the St Pius Social Hall. Please attend if you can. We have a lot to discuss, so we would really like you to know what’s going on. Hope to see you at the festival this weekend and/or at our meeting next Wednesday! Rosary at 7:00PM. PGK Bob Reaume has requested both the LOTA and Knights of Columbus. Lie in State at St. Pius X Parish at 9:30AM Monday. Funeral service at 10:00AM. I hope to see as many Brother Knights from our Council as possible. It’s with great sadness to share the news of the passing of Jeannette Reaume, wife of PGK SK Bob Reaume on Thursday, June 20th. She was not only our First Lady when SK Bob was our Grand Knight, but she was the Past First lady of the LOTA for Assembly #475. The funeral arrangements are still pending with Molnar Funeral Home in Southgate. I will send an update when I know more. May her soul and all the souls of the faithful departed through the mercy of God rest in peace. Amen. And may the perpetual light shine upon her. VIVAT JESUS! Most council end their fraternal year (June 30th) like a lamb. We prefer to end it like a LION! There is a regular business meeting this Wednesday, June 7th at 7PM in the St. Pius Social Hall. Please try to attend… we have a lot to discuss! 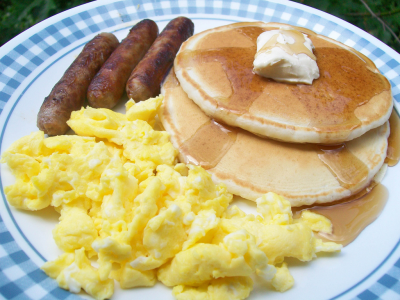 For example, we are going to be preparing and serving Graduation Mass ‘brunch’ following the 11:30AM Mass this Sunday, June 11th. We only have one service, instead of the normal 3, but would love to have you all come and help with this. This is a great way to congratulate those young men and women for their hard work and maybe we can find a young 18 year old man who would be interested in joining our ranks. Another reason we need you is that THIS WEEKEND (June 10th and 11th) we are hosting a Church membership drive after all of the Masses. We need help passing out interest cards before Mass, answering any questions and collecting filled out cards after Mass. We are only 3 people short of our membership quota of 7 (and one short of our insurance quota of 3), so this drive is extremely important. What should help with our membership drive is that WE are hosting 1st, 2nd and 3rd Degree Initiation Ceremonies at St. Pius on Saturday, June 24th. It all starts with a Mass at 8AM celebrated by our Council Chaplain, Fr. Bob McCabe. Following that, we will have registration, with coffee and donuts. Following that, we will begin the degree work. Following the degree work, we will end the day with a light lunch. We need all of your help on this day to assist with registration, hospitality, and with guarding the doors for this event. The degree work has changed a lot since you probably joined. They are beautiful ceremonies. Please come and join us on June 24th starting with 8AM Mass. The next day, Sunday, June 25th,St Pius is hosting their Potluck Picnic in the Activity Center and soccer field (weather permitting). Our council has been asked to set up (and take down) the tables and chairs for this. Since many of us will be attending, this should be no problem. 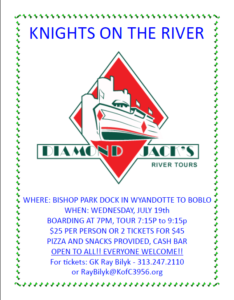 Finally, tickets are now available for the ‘Knights on the River’ Downriver Diamond Jack’s Boat Cruise fundraiser, which will be held on Wednesday, July 19th starting at 7PM from the Wyandotte dock. Tickets are only $25 each or $45 for 2. Pizza and snacks are provided, and there is a cash bar. This event is OPEN TO EVERYONE, members and non-members. We have a limited supply of tickets, they went fast last year. Don’t wait to purchase yours! I will have them at Wednesday’s meeting, and arrangements can be made for pickup and delivery. As I said, we’re finishing strong! With your help, we can finish BIG as well! If you have any questions, please don’t hesitate to contact me at raybilyk@kofc3956.org . Hope to see you this Wednesday… God Bless You and God Bless the Knights of Columbus! 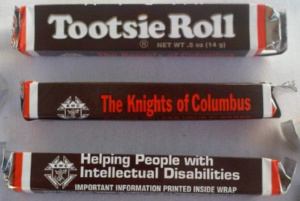 This weekend after all of our Masses, we will solicit donations as part of the Michigan Knights of Columbus ‘MI Drive’ (more commonly known as the Tootsie Roll Drive). We need the help of every member to make this a success! With your help, we can help others! Hope to see you all this weekend! God bless! Due to the power outage still affecting St. Pius X Parish, we must cancel our Charity Family Breakfast scheduled for Sunday, March 12th. We apologize for any inconvenience this may cause, and hope you will support our next breakfast on Sunday, April 16th.